Have a Kids Birthday Party Here! Having trouble coming up with unique Birthday Party Ideas? How about a Spa Birthday Party? That is one of our BEST ideas for a Girls Birthday Party! Well, talk about pampering! 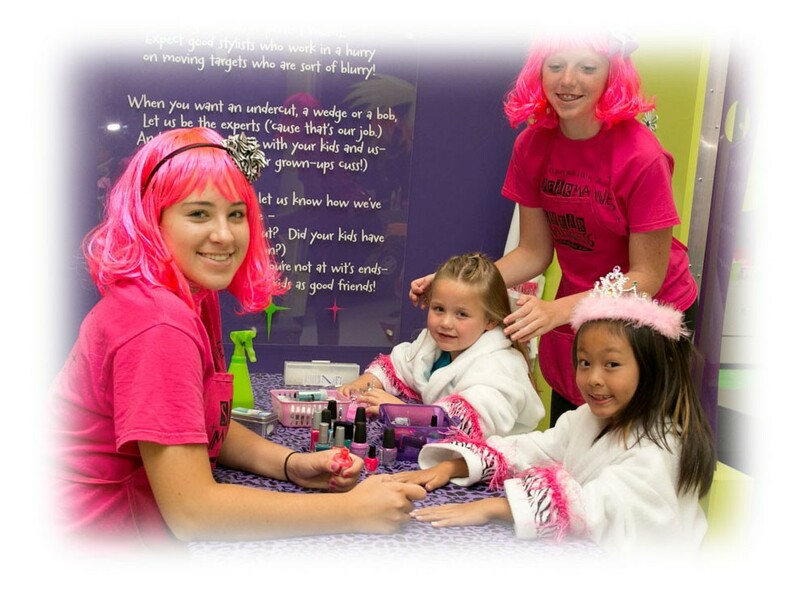 Girls adorn Spa robes and are treated to Fun Updos, Glittery Makeup, and Fingernail Polish – all by our Pink Starlets! Add in some Karaoke Fun and a Party Favor of the guests’ choice and you’ve got your party done! Want a Celebration without the Party? How about just a Diva Day for your special Birthday Girl? A Diva Day is the Fun Updo, Glittery Makeup, and the fingernail Polish – just without the guests, etc. We can do that too! Just book a Diva Day Appointment anytime! Details for your chosen location are found here! Click on the location of your choice in the links provided below in order to view more details about the parties offered at that location. Parties vary by location, so please call for details and reservations.